Modern Manners For Your Inner Demons, ISBN: 9781939650627 - available from Nationwide Book Distributors Ltd NZ. The best-selling indie hit returns! This revised, expanded edition of Modern Manners for Your Inner Demons brings the darker side of social behavior back to the shelves. 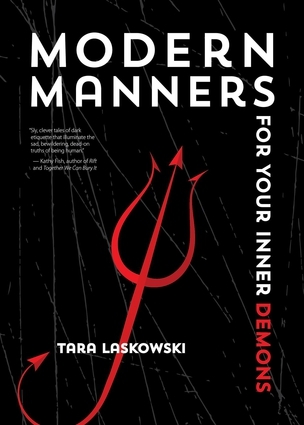 Tara Laskowski’s demonically clever stories break the rules of a "decent" society, providing a definitive guide on the etiquette of obesity, dementia, infertility, homicide, arson, and more. Blending humor with a sharp social commentary, Laskowski introduces us to cynical yet sympathetic characters as each story unfolds. Snarky but optimistic, these characters are the folks you want sitting next to you at your next dinner party...or in your prison cell.